Yesterday was quite the day. I mean, in addition to Gene coming over and helping us from morning until after dark as we threw drywall liberally about the dining room, I also managed to knock over and break my laptop which has served me faithfully through years of architecture school and a 250-mile commute and dangerous studios and many other falls on the floor. So everything is a lot slower now because Noel fixed the problem by performing a heroic lappyotomy and putting my hard drive in his old laptop, which has a faster processor but half the RAM. Friends, it turns out that Photoshop, which I use for hours every day and especially for putting these posts together, uses quite a bit of RAM. So everything is very slow right now. Also, this laptop has has a funny space bar so I have to go back and edit everything to add the spaces it randomly leaves out. Anyway, whining aside, we had an awesome day of work yesterday, and we have been totally suffering for it today. This is where we started: we'd stripped the room halfway of plaster and lath, had pulled the old knob-and-tube wiring out and replaced it and the even iffier more modern stuff with safe, code-exceeding wiring, and Noel had done some crazy dirty work removing the mysteriously extensive collection of cast iron pipes running all over the attic and going nowhere. That was the room about an hour before Gene showed up, as we were clearing away the wiring supplies and other junk littering the floor in preparation for what pros call "rocking" the room. 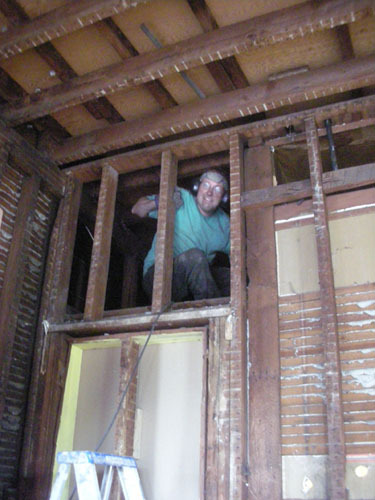 Here's a brief tour of some of the stuff we'd been doing (in between pulling lath nails). We had this crazy switch by the side door. 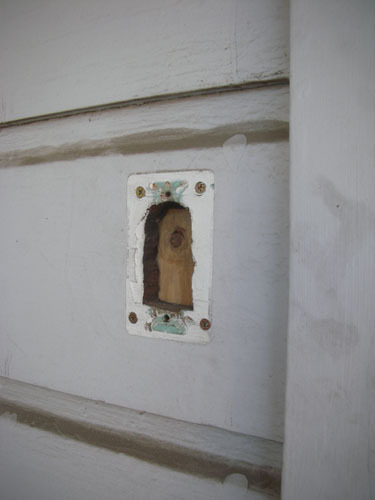 There were two switches: one for the room light, one for the outside porch light. And on the other side of the wall on the porch was a light switch which turned on the porch light, so anybody outside the house could turn on the light. It was wired up in a way that could only be described as a major hazard, so we fixed that. This is what the hole now looks like on the side porch. I'm not sure how we'll go about hiding it, or if we'll even bother. We're planning to completely change how that wall works at some point and it's probably not worth fussing with the siding until we're done with that. This spot is (mostly) protected from the weather, anyway. Friday night Noel spent a few hours up in the dropped ceiling of the pantry, cutting those random pipes out. There were so many of them, it was almost ridiculous. By the time he came down from there (notice there are still some pipes when I took this photo, above his head and just a couple bays to the right of him), he looked like he was a coal miner. I took some reference photos in the kitchen ceiling (dropped when they closed off the door to the old butler's pantry, I think) and pantry ceilings, but mostly to be able to know what the framing there is like. The ceilings in both rooms appear to be held on with a lot of optimism and possibly by shear ignorance of the law of gravity. 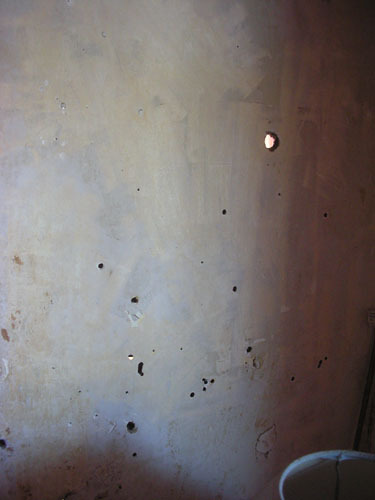 Then I said goodbye to my favourite part of having the walls down, which has been the view into the dining room through these holes in the hallway plaster. With Gene there, we made quick work of the drywall. I admit that I'm not much help on this kind of project because I lack the upper-body strength and height to make a really solid worker. But I'm going to get my workout on the taping and mudding and plaster repair to come. 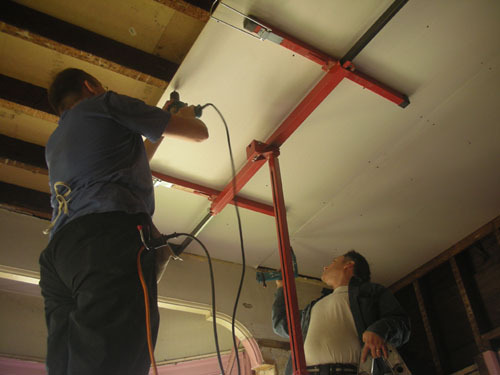 In some ways the ceiling was the easiest part of the drywall to do: it was mostly square (for 1876 values of square) and we had the drywall lift graciously on loan from Gene to help us out. We started working after 10am (at the last minute we realized we didn't have nearly enough drywall screws so there was a panic run to Pagano's), and got the last panel up just before 3pm. We had a brief break for lunch, then powered through on the walls. Apart from one little patch that we left undone (you can juuuust see it in the upper right of this photo), we got all the drywall up before 6pm. The change in the room felt really nice last night, but this morning, in the daylight, it was spectacular. We spent much of the day today cleaning the room up: vacuuming dust and dirt, washing the floor a couple times, putting tools away. And complaining about our aching backs. Around the edge of the room where we pulled off the molding, you can see the plywood they threw over the old floor, and it is so tempting to consider pulling it off and sanding the old floor. If it weren't that the condition of the floor underneath could be so bad that we'd regret it, I'd be there with the pry bar right now. As it is, I just look at that every time I walk by and daydream. the little voice in your head says 'do it'! Old floors are great. Your odds are good. You're never going to have a better chance. 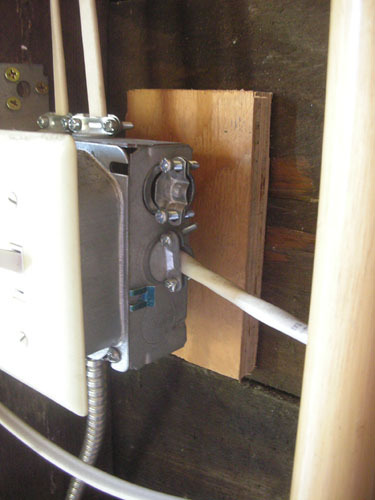 Might it be useful to have an outlet on the porch, where the outside light switch used to be? Jim, the long-term plan for the room is that it is going to become our kitchen. But before that happens, we'll be adding a second story on top, which will require basically re-framing the entire room. Insulation will be added then. 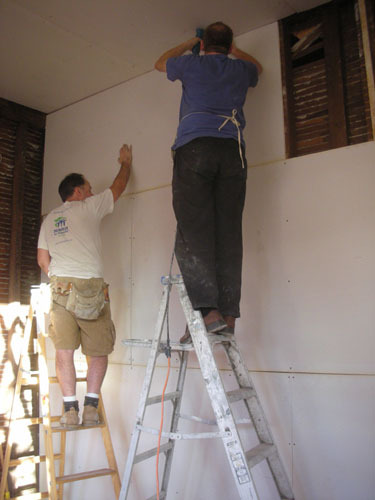 We didn't have enough of the exterior wall open to add insulation at this point. Brent, I don't think that's a great location for an outlet. It's about 50" up from the floor level. Intellectually I know that height doesn't matter for outlets, but aesthetically it would bother me. Two questions from Mr. Curious: (1) are you planning to add any texture to the drywall to mimic old plaster?, and (2) what species of wood is below the plywood (can't tell from the picture)? 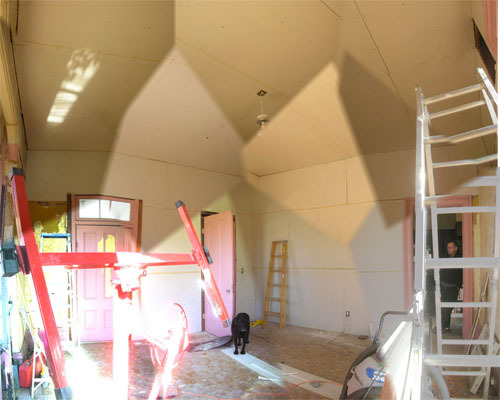 We're just about finished with our master bedroom, which had painted fir floors and cracked plaster walls. Looks good now but WOW were those projects a lot of work! And I'm not certain of the species of wood; a neighbor who does floor restorations told us it is some kind of softwood, and fir is not unusual. That's what's making me wary of lifting the plywood: if it's in really horrid shape under there then we're stuck. Of course, from the bottom (we can see the bottom in the basement) it looks great, but who knows what happened to the top that made them put the plywood/stick-um tiles down. 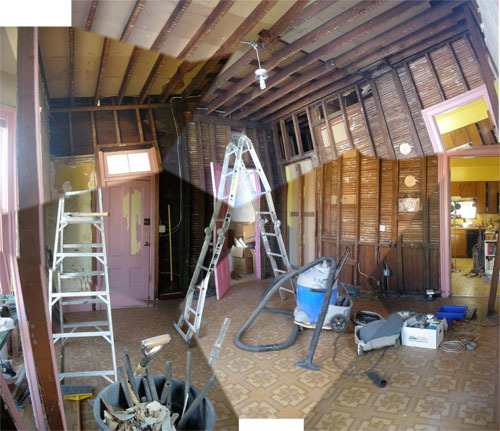 When we made our decision, we had two possible outcomes in mind: if the floor was salvagable, we'd refinish it. If not, we'd Pergo over top. Happily, we're still Pergo-free. Although fir is technically a softwood, the 200-300 year old stuff is pretty hard (i.e., 150 year old tree felled 130 years ago). Though not quite as attractive as the matchstick oak flooring downstairs, it cleaned up nice. Any visible or discenable reason why they would added the charming plywood/sticky tile dynamic duo? There's no reason we can see, though I will say that in places where they *didn't* put down ply/stickum the gaps between the floorboards make it very difficult to keep clean, and I often get splinters while running around barefoot. With between 9 and 4 kids in the house, I can see why a mop-able surface would appeal. My longterm intention is to put down a hardwood floor of higher quality, so I suppose preserving the softwood original is not critical. Maybe we'll try prying up a single piece and seeing how that goes. After, of course, I finish all the goopy plaster repair and mudding. 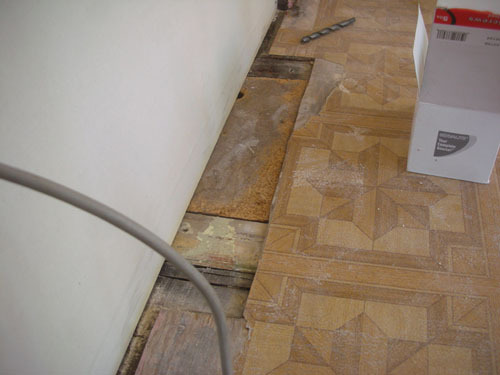 Don't give up on the softwood floors so quickly. At our last place in West O the floors were softish doug fir and looked super-duper chewed up but this flooring company came in, patched the bad spots, puttied the gaps between boards and refinished it and it came out darn nice...it has 'old house charactor' to be sure but it looked good. 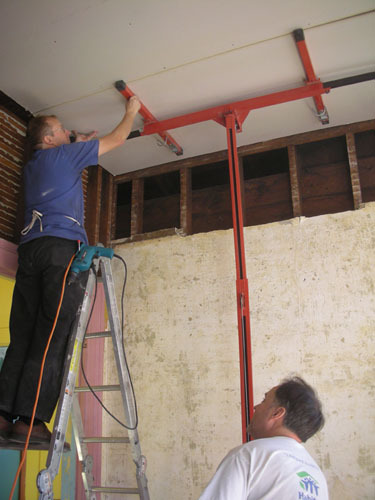 We use a hammer to pull the lath nails, just as you would with ordinary nails. When they don't want to come out I whack them until the end falls off, then nail the last bit into the wall. Some of them are so rusty that they just kind of fall apart when I go to pull them. And it's not that I've given up on the floors. We're just out of money at the moment, and dealing with the dining room floor would be an added expense.